Is there a Canonical list of Xcode Environment Variables that can be used in Build Rules etc? UPDATE: This list is getting a little out dated (it was generated with Xcode 4.1). You should run the command suggested by dunedin15. dunedin15's answer can give inaccurate results for some edge-cases, such as when debugging build settings of a static lib for an Archive build, see Slipp D. Thompson's answer for a more robust output. GCC_PFE_FILE_C_DIALECTS                    "c objective-c c++ objective-c++"
EXCLUDED_RECURSIVE_SEARCH_PATH_SUBDIRECTORIES              "*.nib *.lproj *.framework *.gch (*) CVS .svn .git *.xcodeproj *.xcode *.pbproj *.pbxproj"
LIBRARY_SEARCH_PATHS                 "\"/Users/username/Library/Developer/Xcode/DerivedData/project-dxdgjvgsvvbhowgjqouevhmvgxgf/ArchiveIntermediates/Project Distribution/BuildProductsPath/Distribution-iphoneos\"  \"/Volumes/Development/Project Game/Project-v1/FlurryLib\""
PATH_PREFIXES_EXCLUDED_FROM_HEADER_DEPENDENCIES  "/usr/include /usr/local/include /System/Library/Frameworks /System/Library/PrivateFrameworks /Developer/Headers /Developer/SDKs /Developer/Platforms"
PFE_FILE_C_DIALECTS                  "c objective-c c++ objective-c++"
This will dump a list like the one shown above to the standard output. Although @dunedin15's fantastic answer has served me well on a number of occasions, it can give inaccurate results for some edge-cases, such as when debugging build settings of a static lib for an Archive build. To add, (with the target in question selected) under the Build Phases tab-section click the little ➕ button a dozen-or-so pixels up-left-ward from the Target Dependencies section, and set the shell to /bin/bash and the command to export. You'll also probably want to drag the phase upwards so that it happens just after Target Dependencies and before Copy Headers or Compile Sources. Renaming the phase from “Run Script” to “Log Build Settings” isn't a bad idea. Apple's "Build Setting Reference" documentation for what's officially documented (or as rjstelling's answer shows, use env in a build script to see what Xcode actually passes you. This has been answered above, but I wanted to suggest an alternative. When in the Build Settings for you project or target, you can go to the Editor menu and select Show Setting Names from the menu. This will change all of the options in the Build Settings pane to the build variable names. The option in the menu changes to Show Setting Titles, select this to change back to the original view. This can be handy when you know what build setting you want to use in a script, toggle the setting names in the menu and you can see the variable name. In Xcode 4 and possibly before, in the run script build phase there is an option "Show enviroment variables in build phase". If selected this will show then on a olive green background in the build log. It will copy the Target Build Settings file into your Main Bundle (will be called BuildSetting.pbxproj). Not the answer you're looking for? Browse other questions tagged xcode build-process environment-variables clang or ask your own question. Xcode build setting “Build Products Path” (CONFIGURATION_BUILD_DIR) is a lie? 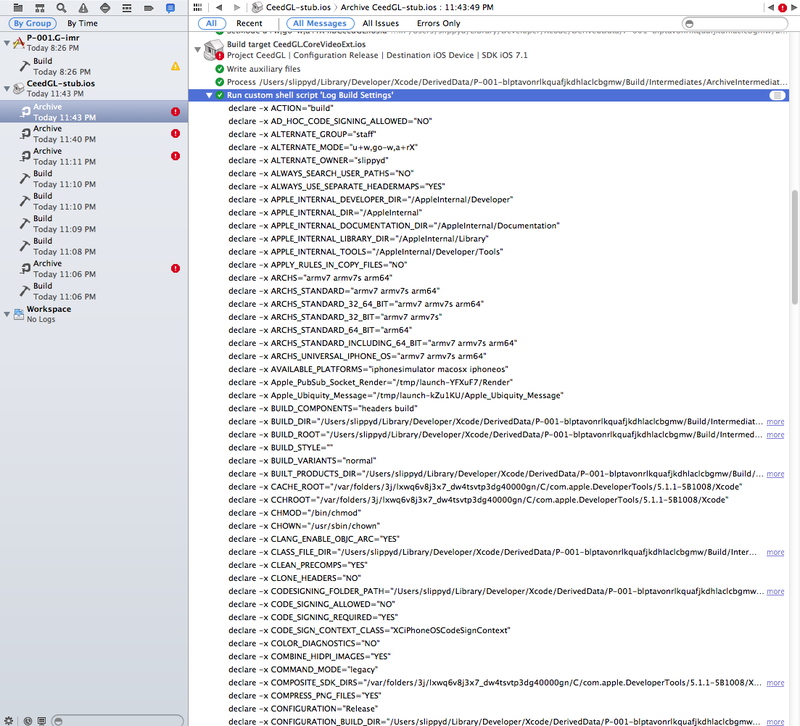 XCode 4 Relative #include paths in search? How to convert Makefile into XCode compatible configuration? 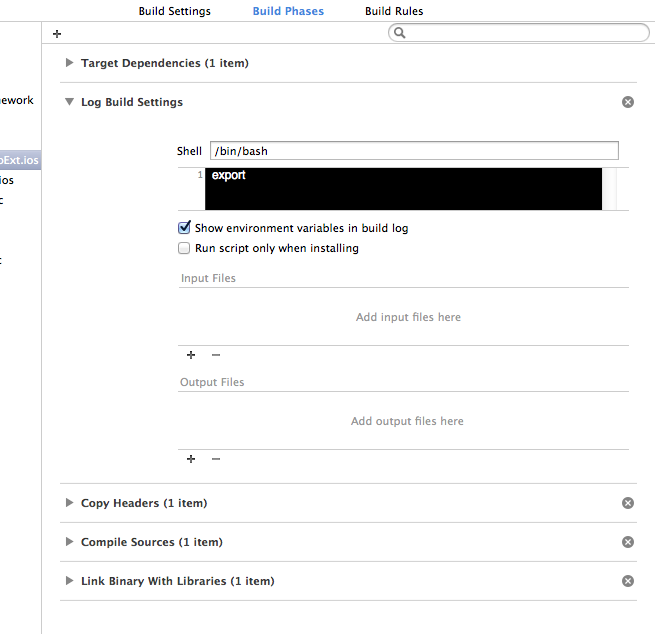 How to set environment variables in Jenkins?